The far-right president's decision had provoked widespread condemnation. 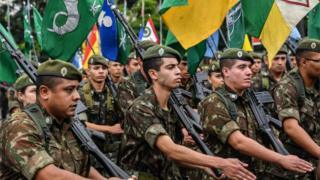 Judge Ivani Silva da Luz said the event celebrating the 55th anniversary of the coup was not "compatible with the process of democratic reconstruction". He said commemorative dates must be approved by the country's Congress. During the 21 years of dictatorship in the 1960s and 70s, at least 434 people were killed or disappeared, according to the findings of a 2014 national truth commission. On Tuesday, Brazil's Federal Public Prosecutor's Office (MPF) issued a statement that said celebrating the dictatorship would be celebrating "an unconstitutional regime responsible for serious crimes of violation of human rights". "This initiative sounds like an apology for the practice of mass atrocities and therefore deserves social and political repudiation," the statement continued.